My economics training as a sociologist — with a background in American Culture studies — has been spotty and roundabout. I got a healthy dose of Marxist economics in college, and then some feminist economics, a little human capital theory and some dated econometrics in grad school and since. All that made reading made it interesting, and also frustrating, to read The Price of Inequality, by Joseph Stiglitz – a winner of the Nobel Prize for economics and an “insanely great economist,” according to Paul Krugman. On the plus side, I am glad to see someone within mainstream economic theory freely discussing all the ways that common assumptions simply do not predominate in the modern economic scene. Especially helpful in this category is his discussion of how “rents” accumulate vast resources at the upper end of the income distribution, with perverse effects on economic development and politics alike. At the very top — in the finance sector especially, but also in energy and big manufacturing — there is nothing like free-market competition. And the beneficiaries of those distortions are the most powerful players in the economy and political system. It is refreshing to see this concentration of wealth described as waste and distortion, as their vast profits provide little gain to anyone else. In fact, dumping vast wealth on the 1% creates a drag on the macroeconomy while fueling the historic run-up in economic inequality. This is all very timely and takes you right through the financial crisis up to early 2012. So if you want to understand from an economic perspective how “the market” in America isn’t the way it’s supposed to be, this book may be for you. 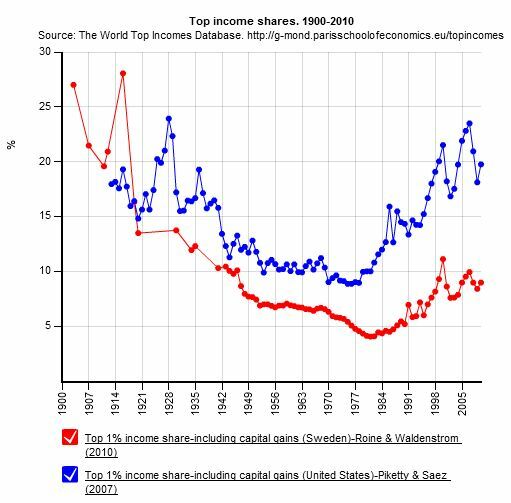 Top 1% income shares, including capital gains, for the U.S. and Sweden. From the World Top Incomes Database. The other good thing about the book for many readers will be its cogent and comprehensive economic rationale for the liberal reforms that many of you probably supported already. Stiglitz makes the case that a suite of reforms – an agenda Rachel Maddow, Elizabeth Warren and Robert Reich probably agree on – would, by (directly or indirectly) increasing taxes (or reducing subsidies) on the wealthy and redistributing wealth downward, reduce the federal debt, increase economic growth, and reduce economic inequality all at the same time. Round numbers: if the richest 1% earn about 20% of all income, then taxing them another 10% would generate government revenue equivalent to 2% of GDP. (And it wouldn’t hurt anything, since they just hoard or waste their extra cash anyway rather than “creating jobs” with it, and they’re so greedy they wouldn’t be discouraged by the disincentive effect of higher taxes.) That’s an amount of money that could actually be useful for poor people. Social sciences like economics differ from the hard sciences in that beliefs affect reality: beliefs about how atoms behave don’t affect how Adams actually behave, but beliefs about how the economic system functions affect how it actually functions. George Soros, the great financier, has referred to this phenomenon has “reflexivity,” and his understanding of it may have contributed to his success. Anyway, the book is easy to read and informative, and has lots of footnotes and references. That doesn’t engender trust in sociology.